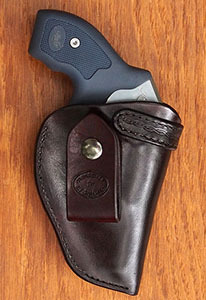 I specialize in inside-the-waistband (IWB) holsters for classic guns. 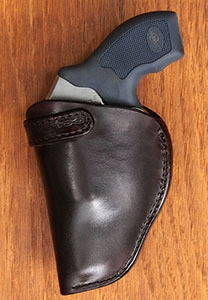 I also make a few IWB holsters for common concealed carry pistols and revolvers, and a few pancake holsters for very small guns. 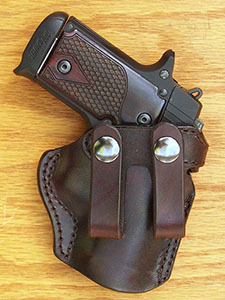 All my holsters are handmade, double-stitched by hand, and generally more expensive than machine-made holsters. 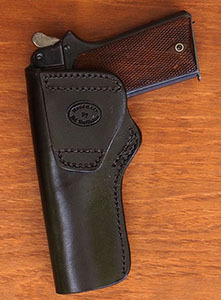 But you get what you pay for. 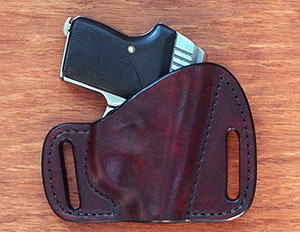 Since each holster is individually hand crafted, what you buy may differ slightly from the photos below. 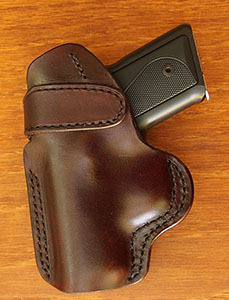 I make holsters almost exclusively in horsehide. 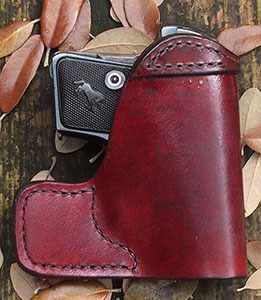 I use calfskin or goat kid to line some holsters, in an attempt to reduce wear on the finish of the gun, but I make no guarantee about the efficacy of linings in holsters. 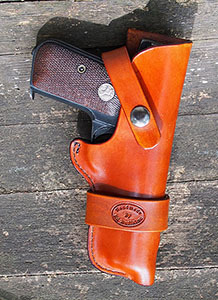 All holsters are made to order. 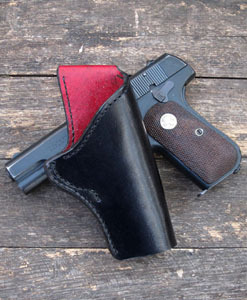 Shipping for small holsters in the U.S. is $7.90 and subject to change over time. 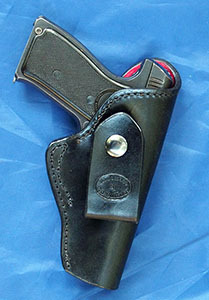 Overseas shipping usually runs about $35. 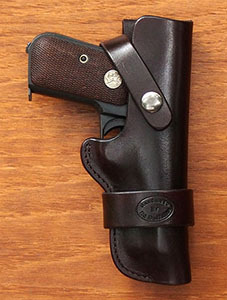 I accept PayPal, cashier's checks, and money orders. 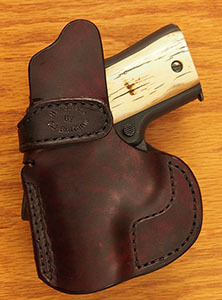 I do not accept personal checks. 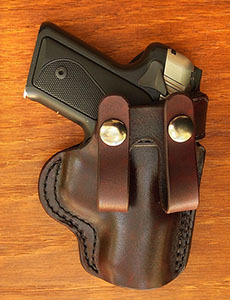 Generally I prefer to make the holster first, then send the customer photographs, then accept payment. 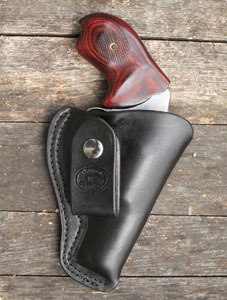 I require prepayment in the case of left-hand holsters or any holster that might be difficult to sell otherwise. 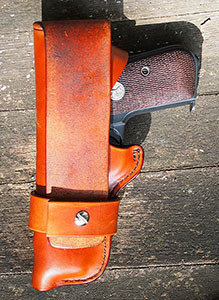 E-mail me for pricing and other questions: ed@unblinkingeye.com. 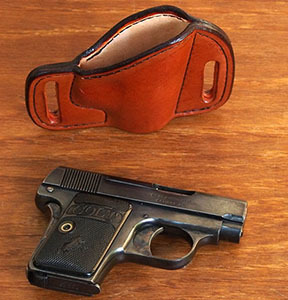 IWB Holster with swivel strap for 1903 Colt .32 or 1908 Colt .380 - Horsehide lined with calfskin or goat kid. 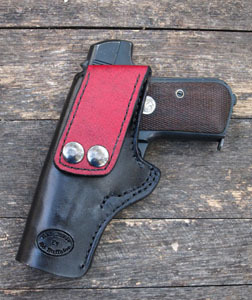 IWB is generally considered the best way to conceal a gun. 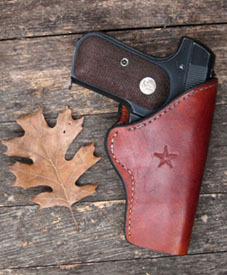 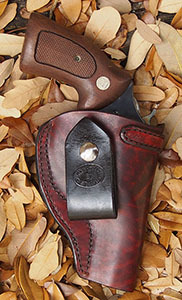 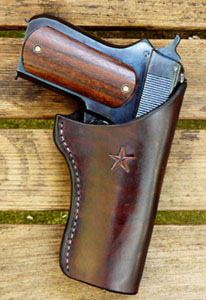 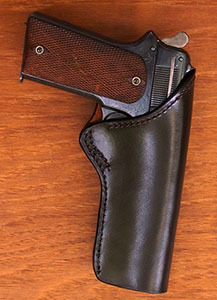 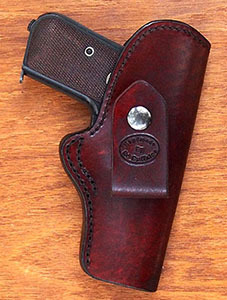 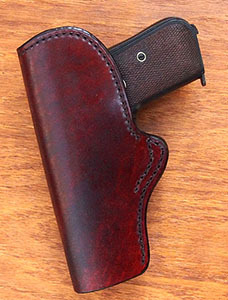 OWB Crossdraw Holster for 1903 or 1908 Colt - lined with calf or goat - Intended for competition, but may also be used for concealed carry in some circumstances. 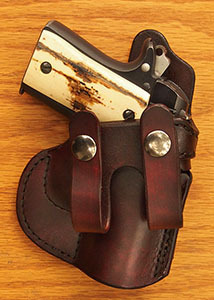 1903/1908 Colt Loop Holster with retention strap - unlined cowhide. 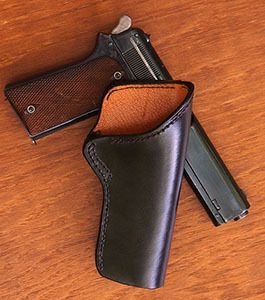 Intended for field carry - fits any size belt. 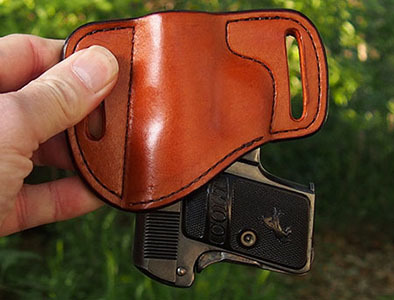 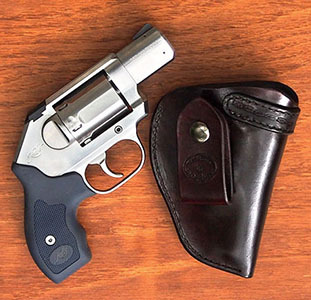 Handmade holsters provide a superior fit.